Over the years, many families return to Rutland Manor for their second puppy and in some cases their third or even fourth puppy. I love the way such long lasting friendships are forged and this is just one of the many things that makes it all worth while! BUSTER 8 years old wants a new buddy ! 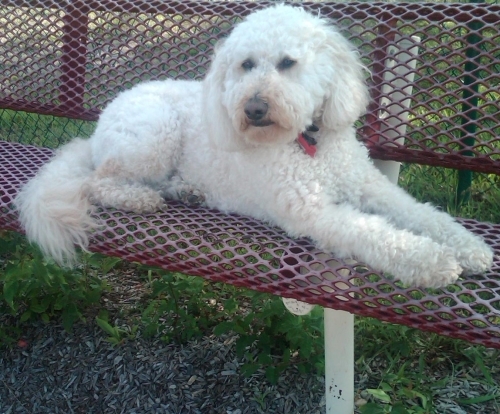 Hello, About eight years ago, we received our Australian Labradoodle "Buster" from Rutland Manor. He remains as active as ever! We could not be happier. I am inquiring if Buster could have a playmate. He is extremely sociable and loves being around other dogs. He would love having a younger sister or brother to look after. Could you please let me know as to availability. Its been a while since we corresponded so I am unsure as to how things and the process may have changed. Here are some photos of Buster. He is a great dog. He loves everyone. He is a bit excitable but overall everyone loves Buster. Everyone knows if you get close he will start licking! Our only issue had been a bit of hyperactivity that seems to have calmed over time. I am allergic to dogs and have asthma. Other than an adjustment period during week1, there have been no issues. His coat is perfect. He hardly sheds. Physically, he is like an athlete. He loves to run and jump. He would prefer to be outside all the time chasing rabbits and squirrels! (He never gets close!) He could care less if it's raining or a blizzard, he's got me outside constantly. He is so graceful people think he is a show dog! Here is the story I promised you of Dismas and his Uncle Walter. When we moved to Kauai we were fortunate to be adopted by our neighbor. He calls my husband and myself his brother and his sis. He keeps his pet cows and horses in the pasture across the street, and has always kept a watchful eye on our daughters and our animals. Dismas is his favorite. Several years ago Walter had a stroke and was unable to care for himself and so came home from the hospital to stay with us. For two weeks Dismas stayed by his side from morning to night with no prompting from any of us. He just knew that the family member that needed him most was his Uncle Walter. Walter is also completely deaf and only reads lips, so Dismas had to let him know by tucking his head under Uncle's hand if one of us was trying to get his attention. Dismas has had no formal training as a service dog, just his love for his family and his natural empathy for us. Walter has told his own real family, as well as many people in our small community about "that big curly one that saved my life." He is fine now, and has moved back home, but still spends lots of mornings with us. Dismas lets us know as soon as he hears the truck. Please open the gate. His Uncle is here! Their first Rutlands Puppy 'PEBBLES' is a year old (2011) and will be joined in December by 'DOOZLE' whose mother is the litter sister of Pebbles' mother. Another Rutland Manor 'double doodle' family! Bear and Rose in New York are full litter siblings one year apart. I wanted to check in with you to let you know that Bear and Rose are doing well and are thriving here in New York. They both have wonderful personalities and dispositions and are true members of our family. I can’t imagine what it would be like for them or us if they were not together as a team. It is funny how we came to get them after we lost our Lulu from another breeder, but I truly believe that everything happens for a reason and thank you for helping us get through that difficult time. I will check in again later in the year, and please let us know how you and your team are doing. We have a cabin up in the Adirondack mountains in upstate New York, so the pups have been having great outings with the kids and us. I am teaching them to not rock the boat while in a canoe. All the best to you for 2011. Well the 3rd RM doodle arrived for our family today. My parents, in New Jersey, picked up Maggie and got in at 3:30 this morning with their little bundle of joy! 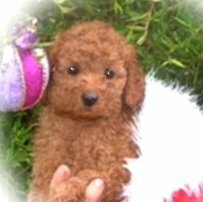 The 4th doodle for our family arrives next Wednesday to our home in Colorado. As we spend the summers in New Jersey – we will have all 4 dogs together in June and July.It should be a wonderful thing to see. As for now, we have a few months to get the new ones potty trained and the older ones used to the little ones. Many thanks for RM for all the wonderful Doodles, the excellent grooming demonstration in NJ this summer. We are counting down the days until our little one (yet-to-be-named) appears next week! We have had just the most wonderful Christmas with these two doodles Darby and Mousse. Watching young Jack romp with them, giggle as they lick his face, push nibbling Mousse off with a loud "No Nibbling!"... just too much fun. Darby has changed a lot in the last month. He has changed in the last WEEK! Suddenly, he's becoming protective of Jack - whom he barely knows. Yesterday Mousse was grabbing onto Jack's shirt as he ran. Jack protested. Darby came up and got between Jack and Mousse and growled at Mousse to tell him to cool it. We were astonished. We have also noticed that suddenly , since the addition of Mousse, Darby's getting white hairs on his head -- in his eyebrows, etc. He's long had a few whites in his back, but this is the first we've noticed them in his head hair. We've been kidding him about what a tough thing it is to raise a youngster! Grey hairs, indeed! Mousse continues to amaze me. He is so very mellow. Much less demanding than Darby was at the same age, but there is also the multiple dog factor. We've discovered that we don't have the same dominance issues we had with Darby because Mousse is clearly the last one in the pack and Darby keeps him there. I'm also tickled to have a doodle that is quite different. His face is rounder than Darb's was -- fluffier. I'm just intrigued with the Brandy-bear look. My daughter Kathy’s correspondence with you has encouraged me to share yet another Ebbie story. She is the most perfect rectory dog, now she is grownup – welcoming and friendly to all, sitting quietly before any child she encounters, saying hello to anyone who comes to rectory but happily going out of the study when she is told. She is loved by all and well known in the community. I have had a number of dogs in my life, and we had three Labradors since we were married, but after problems with hips, we decided a labradoodle may be the way to go. And physically she is perfect. 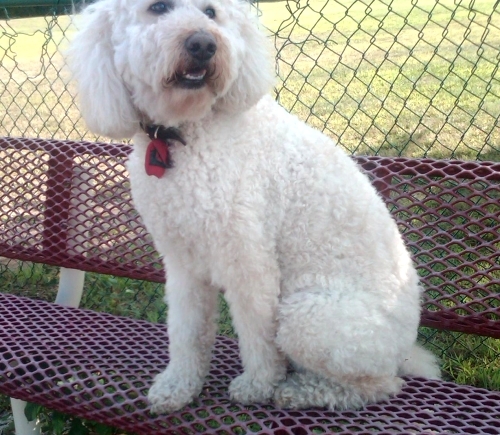 But she has an intelligence, a sense of humour, and a sense of “being right” that make her a wonderful companion dog. We all love her to bits (even Dennis who is not a ‘doggie’ person). Keep up the good work breeding such wonderful companion dogs.